If you’re looking for a patriotic and uber healthy dessert, look no further! For Memorial Day, we headed to my dad’s house for a backyard BBQ. Before I had both feet in the door, I’d been recruited to help with the fruit flag. It’s not terribly time intensive, and with 2 of us working on it, I was surprised at how quickly it came together. And I learned quite a few tricks along the way. Use a straw to take the stems out of the strawberries, then line up and slice in bulk. Use a disposable lasagna size foil pan, or rimmed baking sheet. A 9×13 baking dish isn’t big enough! Wash, remove the stems, and slice the strawberries. Set aside. Wash and drain the blueberries. Set aside. Peel and slice the bananas. You can add some lemon, orange, or pineapple juice to the bananas to keep them from browning if you are preparing this dish for ahead of time. 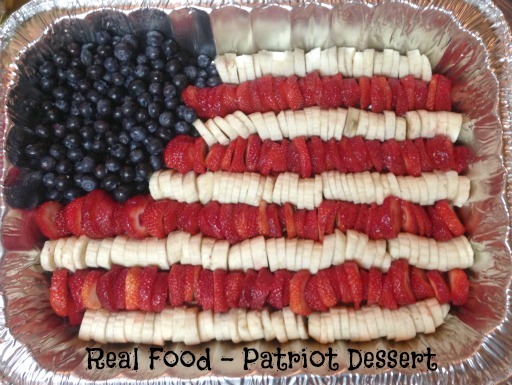 Arrange the fruit in a 9×13 (or larger pan if you are feeding more people) making alternating rows with the bananas and strawberries for the stripes on the flag. Then add the blueberries piled in the top left corner. Add some stars over the blueberries with the whipped cream or white chocolate chips, if desired. Serve Real Food Fruit Flag as a delicious dessert. What’s your favorite Patriotic Picnic Dessert?!? This recipe is featured on Julia’s Simply Southern Meal Plan Monday #120. Allison- You probably mean inaccurate and not politically incorrect. 🙂 Happy Memorial Day!